Lindon has long said that Iâd be very surprised by who will prove to be our steadfast cheerleaders and diehard encouragers and who will step back and âcheck outâ of our circle. While I heard what he was saying, I honestly didnât pay much attention, until I started feeling the weight and reality of his words. Weâve had friends and family bless us with more praise and support than I feel we deserve. Itâs been both inspiring and humblingâ¦even a little embarrassing at times (but in a great way â Thanks Mom!). Weâve also had people I KNEW would always be by our side, those I anticipated to love us though every step of our journey, completely ignore our efforts and snub our excitement. It has been both hurtful and divisive. My husbandâs words keep echoing in my head. No, we didnât embark on this path for accolades or attention; not even close. 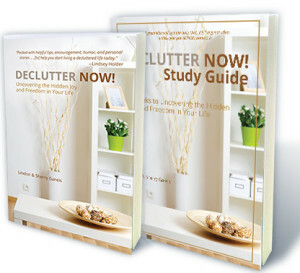 We actually told ourselves that if Declutter Now! was ONLY for an audience of three (God and us! ), then that was okay. We were doing exactly what we felt God was calling us to – and that was all that mattered. We still feel the same. MyÂ disappointment is not about the lack of interest or recognition, but rather the realization that perhaps things were not as I knew them to be. Maybe relationships werenât as strong and intentions werenât as sincere as I believed to be true. I feel a bit deceived. Actually a lot deceived. For every disappointment, however, there are more stories of unexpected support, kind words and loving gestures than I can share in this short blog post. Weâve had perfect strangers take time to let us know how our words have positively impacted their lives. Weâve made friends with people from coast to coast who continually provide advice, share information and answer questions quickly when we’re in a panic for a fast response. Dwight Bain, founder of the LifeWorks Group, Executive Director of the ICCA and participant in a zillion other AMAZING things (if you think Iâm kidding, just Google this guy! ), gave us an incredible platform and launch opportunity before ever personally meeting us. We have a team of people around us, including our publisher, videographer andÂ webmaster that have spent countless hours making sure material is ready to go and looking more professional than anything we couldâve imagined. Our small group members have been nothing short of incredible and go out of their way to share our book and reassure us weâre on the right track. Our church and clergy have been phenomenal and even our bank, yes our bank, has rallied around us. And Iâve been extraordinarily blessed with the friendship from a fellow author Iâve never personally met. Over the past nine months or so this pen pal has grown into a special friend who I love dearly. She heard about a church project weâre working on and without hesitation, shipped us twenty of her books to be raffled off for donations. I have NEVER been as blown away by such a random act of unsolicited care and kindness.Â Thank you from the bottom of my heart Carrie. This crazy adventure of ours has taught us much about the publishing world. Iâm more savvy about how a website is constructed, I now understand intimately how a teleprompter works and Iâve tapped into a marketing side that I never knew I had â and never expected I would like. And social media, well letâs just say I have a LOT to learn but am making significant progress. Twitter scares me no more! But, the biggest lesson Iâve learned is that I should always listen to my husband. Well…maybe not âALWAYSâ…but he sure called this one! Hereâs some love to our âOutside the Campâ folks who are now permanently stuck with us! We thank you all and are blessed to call you friends. Ambassador International â Looking for a Christian Publisher? These people are seriously legit. Shawn Morgan Media â Have you SEEN our website? He rocked it for us. Nothinâ more needs to be said. Brian Kohatsu Video Productions â Professional, talented and patient beyond compare â trust me! Carrie Daws â Are you a fan of Christian fiction? Check out Crossing Values and Ryanâs Crossing. Spectacular. Dwight Bain â Our hero. Seriously. A man of God through and through whoâs the âreal dealâ and then some. It was love at first email. MidFirst Bank â This is NOT just a bank but a community of support and kindness. There is no better bank manager than Andrea. Mountain Ridge Baptist Church â Pastors Monty, Brett & Brad â we love you guys! This entry was posted in Inspirational, Self-help and tagged encourager, fan, help, support. Bookmark the permalink. Had a funny feeling you would understand! 🙂 And ditto on everything…truly! Blessings on you Carrie!